An Exchange is a unique, invitation-only meeting driven by pre-scheduled business meetings between pre-qualified solution providers and senior decision-makers. Thought-provoking conference sessions, executive roundtables and innovative networking opportunities round out the agenda, resulting in three days of focused, structured business development. Unlike traditional conferences or tradeshows, the primary focus and benefit of the Exchange is for new relationships to be forged and existing partnerships to be enhanced. The Exchange only invites executives with the highest credentials and solution providers with the most cutting-edge capabilities to ensure a true peer-to-peer learning and networking forum. Technology is advancing faster than companies can keep up. The amount of data collected now compared to even 5 years ago is unbelievable. Siloed data takes too long to extract and process and must be faster to keep up with the new shift. Predictive analytics, machine learning, and a changing culture in the data analytics spaces are necessitating a move toward using the data analytics strategies that are available to drive value within a company and stay ahead of the pack in terms of data analytics innovation. At the same time, these strategies and tools must be implemented in a responsible way to ensure the safety and security of consumer data. - Internet of Anything: Getting value from data extends beyond devices, sensors and machines and includes all data including that produced by server logs, geo location and data from the Internet. - Security, safety and privacy in the regulated and non-regulated industries. 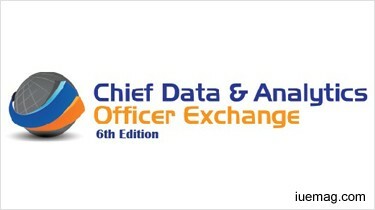 The iUeMagazine team is delighted to work with Chief Data & Analytics Officer Exchange as Online Media Partners & is expected to bring Unlimited Inspiration for all readers from the proceedings of this event. Staying tuned to the enriching updates from this event is recommended. Any facts, figures or references stated here are made by the author & don't reflect the endorsement of iU at all times unless otherwise drafted by official staff at iU. This article was first published here on 4th April 2017.